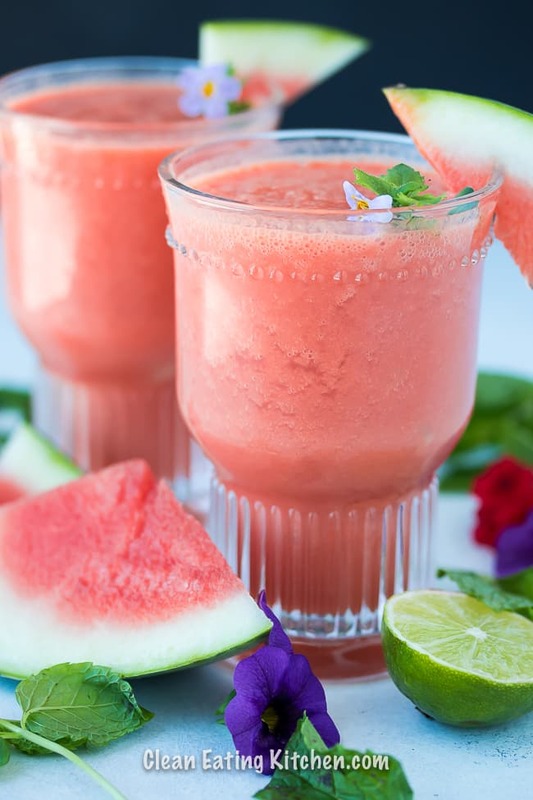 This Vegan Watermelon Slushy is the absolute perfect summertime treat. It’s made using real food ingredients, and it’s vegan and dairy-free with no added sugar. I have such a fondness for watermelon and watermelon-flavored treats. I think I ate my weight in pink Jolly Ranchers as a kid and the pink Starbursts were by far my fave. I mean, honestly, what could be better than that distinctive watermelon flavor? Even the color combination of watermelon red and green is just absolute perfection. Last week, I was happy to discover that the melons are back in season! I bought a giant one for only $5 and loaded it into my car. I even put the seatbelt on it to keep it safe. For the first few days, I just chopped off a hunk to eat after lunch. I got a little bored with it after day 3, though. So, I decided to attempt a watermelon slushy. Note: I published this recipe wayyyy back in July of 2011, but re-tested and shot it for you today. I tried a few different variations until I realized that, unless the melon is frozen, the texture if more of a slushy than a smoothie. But, to be sure, it is a very delicious slushy! So, to be clear, you want to use cold but not frozen watermelon for this recipe. The other cool thing is that the pineapple and the watermelon combined are sweet enough so no extra sweetness is needed (I tried and it was so sweet my teeth hurt). There are only five total ingredients needed for this recipe then: cold watermelon chunks, frozen pineapple, frozen strawberries, frozen banana, shredded coconut, and fresh lime. A few fresh mint leaves are nice, but totally optional! Here is the creation I came up with that is an ideal summer treat. The watermelon flavor is so pronounced and pure that it fuels my determination to never stoop to eating any “watermelon-flavored” creations again! 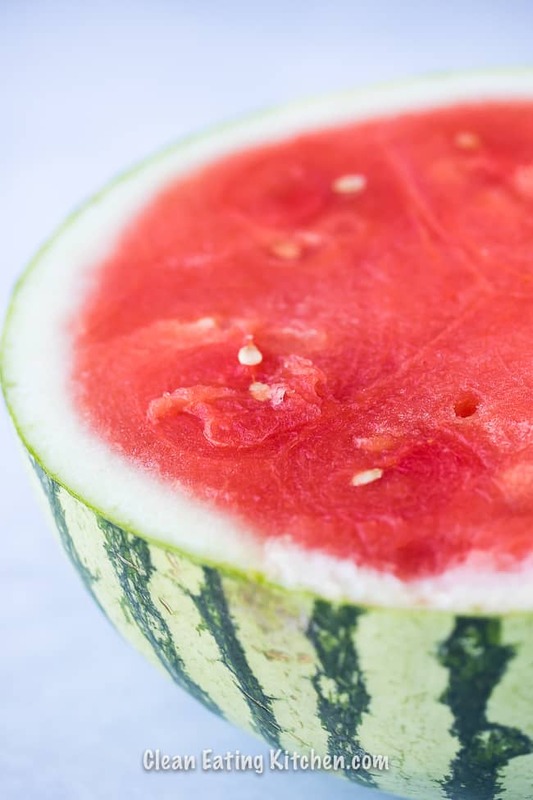 Questions about this vegan and paleo-friendly Watermelon Slushy. Can I use frozen watermelon? Yes, but you will get a smoothie, not a slushy. What’s the difference between a smoothie and slushy? Hmmm, good question! A smoothie can be eaten with a spoon, but a slushy (also spelled slushie) can be eaten with a straw or a spoon. Ha! I made that up, but it kinda makes sense, right? What is my watermelon isn’t sweet? 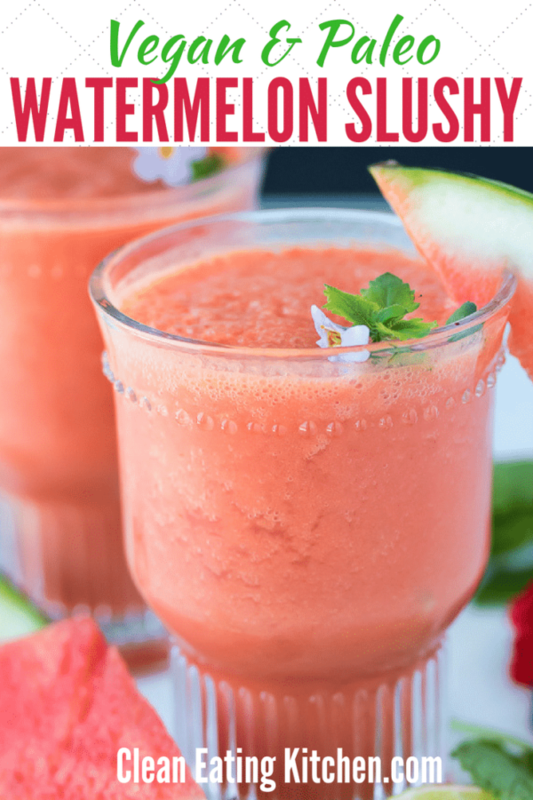 It is a good idea to test your watermelon before making this drink. I’ve had many a not-so-good melons. As long as your watermelon is average or above average on the sweetness scale, your slushy will turn out awesome. Ask me any other questions you have about this recipe in the comments! Combine the watermelon, pineapple, strawberries, coconut, and lime juice in a high-speed blender and process on high until smooth. If using a regular blender, you may wish to process the watermelon first and then add the other ingredients for easier blending. If you want to really brighten the flavors of this slushy, feel free to use some fresh mint. Don’t worry if you don’t have any or prefer to leave out the mint. This recipe is great without mint. 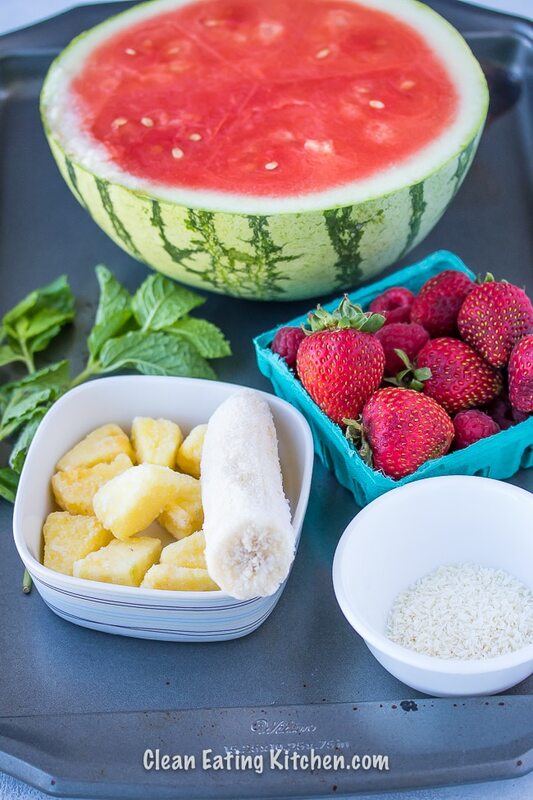 Pin this Vegan & Paleo-friendly Watermelon Slushy to your favorite summertime Pinterest board! This slushy sounds so good! What a delicious drink for summer. The vegan conference sounds great. 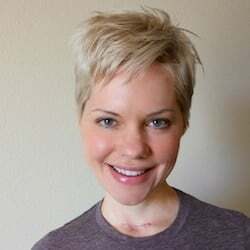 I’m going to the Healthy Living Summit in August, and can’t wait! I want to get to the Healthy Living Summit at some point, maybe next year? Have fun! 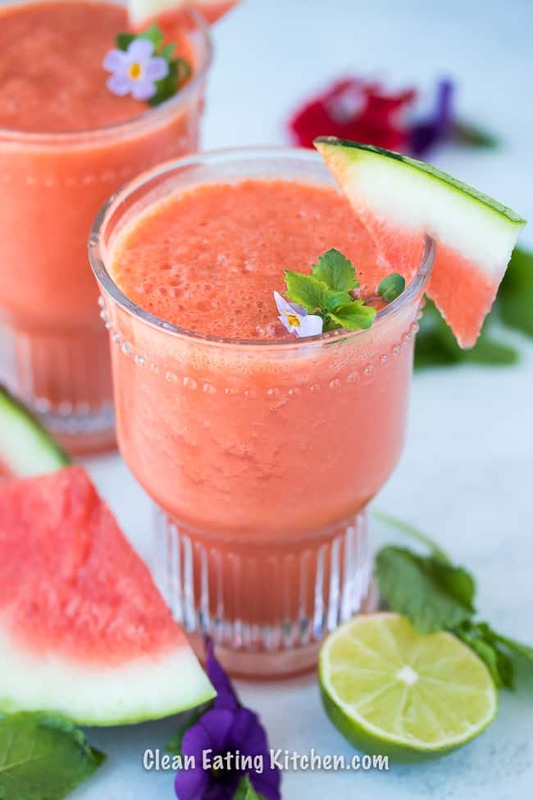 I’ve been OBSESSED with watermelon juice lately – it’s so refreshing! Agreed: watermelon juice is the ideal summer drink. Watermelon?! YUM! 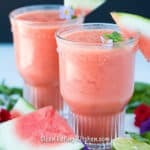 I’ve never tried Watermelon juice, but Watermelon slushies sound INCREDIBLE! I just made something like these for dessert at a party I hosted. I was totally inspired by the video that Gena over at Choosing Raw posted with a fellow blogger. Gena said that she doesn’t even like watermelon but that she loved these. So how could I not try it, right? I served it in little tea cups and it was a big hit. I’m not sure it’s something I would make often, but it sure was a novelty! I bet yours would be great to serve for a kids birthday party in the summer. Only fun plan is a scrapbooking crop this weekend. Hubby and I are going to stay in the hotel for the weekend and he will do something else on Saturday LOL. How exciting for you to go to Portland and meet exciting people!! This sounds like an amazing combo! I once juiced watermelon and cucumber and drank it before bed….it’s more of a morning drink! I’ve never done watermelon in a smoothie, but it sounds so good. Congrats on crossing the halfway point of A&P!!! That must feel really good. Although, the summer sure is flying by! I’m heading to disney world next week, and then for the last week in august I’m staying with my cousin in santa monica. I keep seeing these watermelon flavored drinks at restaurants and I’m so intrigued. I’m going to have to try one this summer! This sounds great! My go-to favorite lately has been watermelon, banana, and strawberry. This sounds like a much more kicked up version…can’t wait to try it! One of my fav summer drinks!!! Wow this is fantastic! I even got the hubby to enjoy it! It is very refreshing and not too sweet! Well done! Yay!!! I’m glad you didn’t think it was too sweet. It sure was refreshing on this HOT day!